A dazzling illusion of stars fading into an infinite starry night sky, designed by Jasmine Grace on behalf of Myer Geelong. 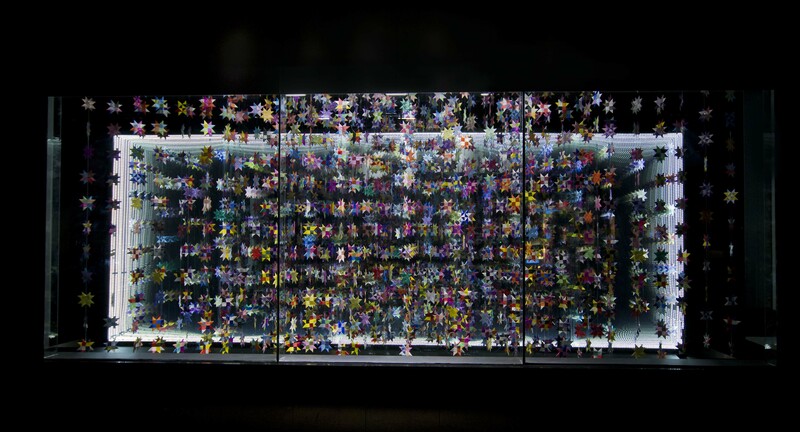 A large scale infinity mirror was used to create this three dimensional infinite starry sky. The One Million Stars to End Violence project is an International weaving project, founded by Artist Maryann Talia Pau, that aims to end violence by bringing people together to weave stars. 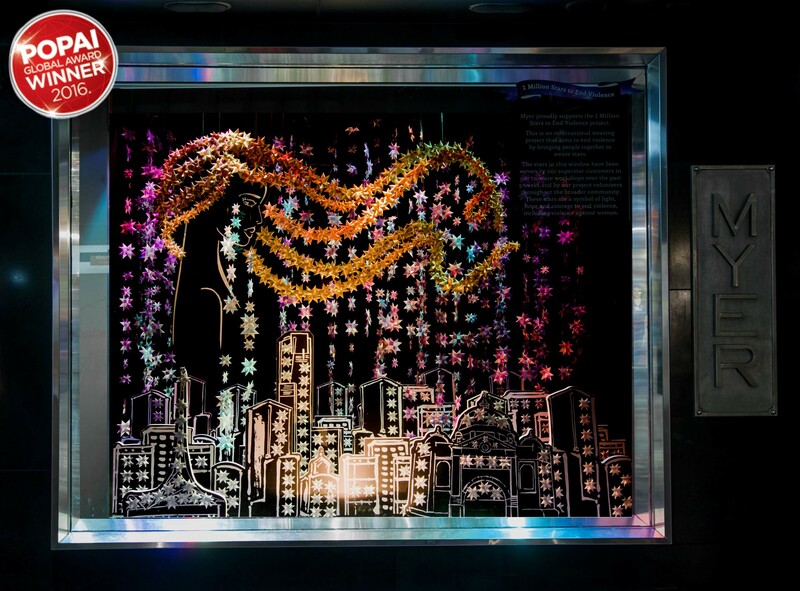 Approximately 1500 stars have been woven for this window by contributors throughout the Geelong community in partnership with Storm Insight. A big thank you to our sponsor, Myer Geelong Social Club for funding the cost of this installation. For more information on the cause One Million Stars to End Violence please visit http://www.onemillionstars.net. Windows installed with ‘photo ready’ theme that was supported by an instagram campaign that encouraged shoppers to like Purple Cow and post their best Purple Cow outfit with the hashtag #purplecowclothing for a free shopping voucher to use in‐store. 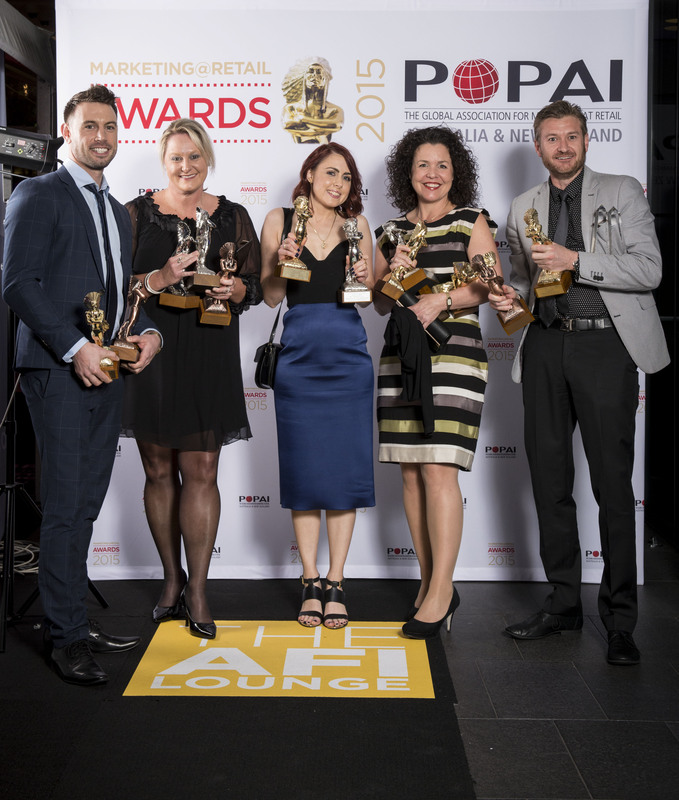 This time last week I attended the POPAI Awards Gala in Sydney on behalf of Myer for the 1 Million Stars to End Violence project and am very proud to share that we took out two awards on the night! As Project Coordinator and Art Director for this project, I am absolutely thrilled with the result. This project is very close to my heart and it has been so rewarding to have not only initiated this collaboration with Myer but to also have had the opportunity to follow it right through to completion, and to have it recognised for it’s success at POPAI. A big thank you to supplier, Active Display who nominated the project for the awards and partnered with us as a Sponsor at the time. The 1 Million Stars to End Violence project really was ‘the peoples’ project. It brought a wonderful sense of community into Myer Melbourne and I am humbled by the impact it has had on the multitudes who participated. Cheers to taking stand and making a difference! Wow so, for those of you who have been following the 1 Million Stars to End Violence project at Myer Melbourne it has now sadly come to an end. However, I hope that for all those who participated in it, that the memory and experience of it will share a special place in your heart as it has in mine. For those who are interested, you can continue to support the 1 Million Stars project as a whole by sending more stars into Maryann for her final 2018 installation. You can find more info about that here. The response and support that we have received with this project collaboration at Myer has been nothing short of overwhelming. From the generosity of our sponsors Active Display, Kerrie Hess, Gift packaging and Stage One. To our workshop volunteers who have so kindly donated their time to teach people. To all those who also took the time out of their busy lives to stop and weave a star. And last but not least, the incredible Maryann Talia Pau (project founder) who came up with this brilliant idea of weaving 1 Million Stars to stand against violence, and displaying them in installations around the world. It has been truly wonderful to see so many people join together and unite in standing against violence. It was everyone’s passion and enthusiasm that really made the star weaving workshops such a positive experience. Not only was it a fun activity for a great cause but many participates also found it to be quite therapeutic. I myself was truly touched by hearing many peoples stories and journey’s in wanting to make a difference. I think many would agree that there was an incredible sense of community and hope in each and every one of those workshops. Personally, I am very proud to have had coordinated this project on behalf of Myer. Everyone together has played such an integral part in making this project the success that it was, of which I am sincerely grateful for. Over 4200 stars where woven for this collaboration. With over 2300 of those having been woven at our in store workshops in Myer Melbourne over a 5 week period. And the rest being woven by various individuals in the broad community. Including Grow Church Melbourne, WOW (Women of Warrandyte), and Melbourne Life Church. All of these stars woven where accumulated into various displays around the store. For those of you that missed out on seeing the stunning star installations at Myer Melbourne. I have collated them below. Each of these installations where designed by myself as art director for the project. Over 800 giant paper stars where woven for this installation by the broader community. The atrium installation was a collaboration between myself and Stage One. I came up with the concept and they constructed and installed it. Sponsor Active Display provided the materials for the paper stars to be made. 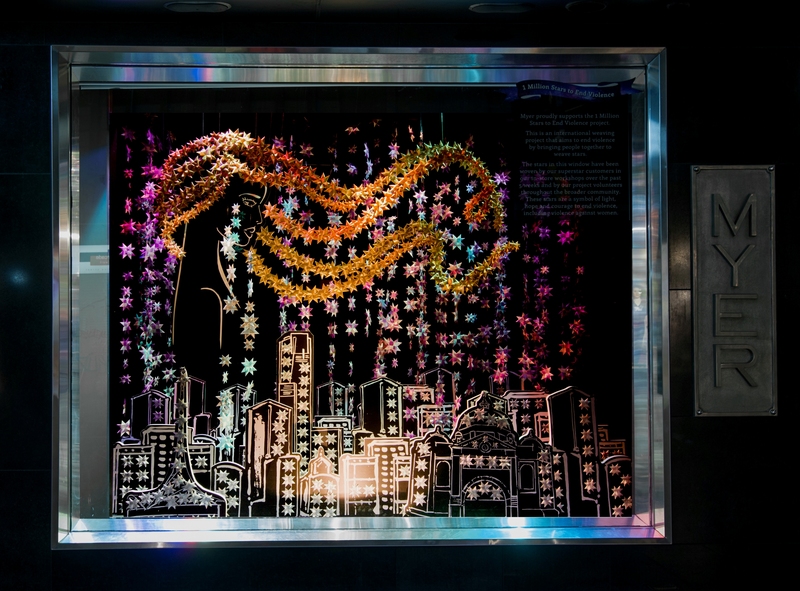 Over 1000 stars woven in our in store workshops at Myer, make up this window that was installed in support of International Women’s Day on March 8th. The window, depicts a woman crying over the city of Melbourne. It acknowledges and mourns for the women who are suffering as a result of the violence that is happening in and around the city. It is also a call to action, encouraging people to choose peace and love over violence. The window concept was created by myself and illustrated by sponsor Kerrie Hess. Structure of the woman’s hair made by sponsors Stage One and city buildings and decals printed by sponsors Active Display. Have a look at this promotional video for the 1 Million Stars to End Violence project launch at Myer Melbourne. I am very proud to be coordinating this project collaboration on behalf of Myer.